"The 300 Spartans were the Delta Force of the ancient world. Their job was to hold that pass or die trying." - Guy MacLean Rogers, PhD. The battle of Thermopylae in 480 BC is justifiably considered one of the most renowned battles of history. Not only did it represent an amazing last stand of a small group of Spartans, holding out for three days against a massive invading Persian force, but it also served as a bulwark that slowed the advance of the Persians enough that Athens could be evacuated and what would become Western civilization was preserved. This History Channel documentary takes a look at this renowned battle, its causes and quite a bit of background information. The History Channel is once again capitalizing on a popular feature film in order to provide historical information regarding the fictionalized events of the movie. That's taken to an extreme here, which not only borrows a logo that resembles that of 300, but also adopts much of the desaturated look of that picture, with CGI enhancements in the battle segments. It does provide a more realistic portrayal of Xerxes (David C. Hernandez), only slightly decadent and not a walking fetish. The portrayal of the Spartan king, Leonidas (Brian Danner), is similarly somewhat subdued, and more willing to believe in oracles than the movie version. The reenactments are merely a dumbshow, however, with the narrative duties handled by mellow-voiced Brian James. He's ably assisted by about half a dozen academics and writers who are enthusiastic about the topic and never dry or dull. Ancient historians such as Herodotus are quoted liberally, going back to the source in commendable fashion to recount the events of the period that led up to the battle. More importantly, the program gives substantial credit to Themistocles and his deceptions that allowed Athens to build a navy that prevented Xerxes from simply going around Thermopylae. The machinations that led to this result, and Themistocles' foresight, make for very interesting viewing. At the same time, there's plenty of action in the Gates of Fire, with the Spartans holding out valiantly. The program makes the further point that the Spartans were not, in fact, alone, even after the Greek armies were sent home before the last stand. Substantial attention is given to Spartan child-rearing practices and infanticide as a necessary part of a militaristic society, centering on young Leonidas' training as a Spartan warrior. This includes the intriguing tidbit that the only persons in Sparta who were permitted a tombstone were men who died in battle and women who died in childbirth, an indication of the subservience to the state in a kind of hive mind full of killing machines. Obviously made on a limited budget, this documentary doesn't begin to have the visual or emotional impact of 300. But it nevertheless offers plenty of fascinating information that makes it an excellent companion piece for that movie. The throngs who enjoyed 300 will almost certainly learn quite a lot from this documentary. Image Transfer Review: The widescreen picture is sadly nonanamorphic. Nevertheless, it's reasonably attractive, with little aliasing and edge enhancement visible. The reenactments are without much color, but the talking heads have vivid color, especially seen in the brilliant red backgrounds. The source material is clean, without any visible damage, as one might expect. Audio Transfer Review: The English 2.0 audio offers little directionality beyond a bit of score and foley effects in the surrounds. The narration is very clear and crisp, as are the historians. The music seems to have reasonably good range for a television program, though it's rather lacking in any sort of visceral impact. It's workmanlike, but not much beyond that. Extras Review: There are no extras. While there are no subtitles, closed captioning is provided. Chaptering corresponds to commercial breaks, with the annoying recaps intact after each. 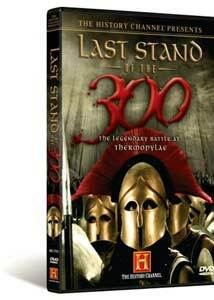 Although it has its crudities, the content is excellent and it provides much of the backstory missing from 300, filling in holes even while nakedly profiting from that movie's successes. The transfer is okay, but there are zero extras.